Why did I read this book: I wanted this book from the second I laid eyes its delicious cover and even more compelling synopsis. When I received a copy in the mail, I couldn’t resist tearing into it – immediately. This review is a little early (sorry, guys! )…but I couldn’t resist. A dead girl hunts the living for revenge. Betrayed and murdered centuries earlier, Okiku is a spirit consumed by rage and driven by her unyielding desire for retribution. She is onryou – a spirit denied peace in the afterlife, and forever seeking vengeance. Over the long years, Okiku roams the earth with a singular purpose: to liberate the souls of fellow victims, and to exact horrific vengeance on those who would abuse and murder others. For a long moment we stare at each other; he, another girl’s murderer and I, another man’s victim. Then my mouth widens further, and I detach myself from the ceiling to lunge, my unblinking eyes staring into his panicked, screaming face. Okiku’s wanderings take her far from Japan, where she was a maidservent in the employ of the lord of Himeji Castle; her unsettled spirit crosses oceans and countries, leaving a trail of bloated corpses of murderers in her wake. One day, in a land far removed from her home, Okiku notices a boy with strange tattoos covering his body and a demon on his back. For the first time in 300 years, she is compelled by a desire other than revenge – to help the sad boy before the seals on his body fail, and he succumbs to the terrible burden he has been forced to carry. Tark’s story, and that of the demon he carries, is one of great pain born of good intentions and impossible sacrifice. But with the determined help and support of his cousin, Callie, and a ghost who is little more than a nightmare in of herself, Tark might just have a chance at surviving the horrors that lay ahead of him in wait. It is not in my nature, to be interested in the living. But there are many things, I have found, that defy nature. The debut novel from Rin Chupeco, The Girl from the Well is a sliver of delicious J-horror in literary form. While rooted in Japanese horror film and lore, Chupeco’s novel also plays with familiar contemporary YA horror tropes – the girl ghost who is compelled to help the human boy and keep him from harm – but with a delightfully sadistic twist. Don’t come to The Girl from the Well looking for A Certain Slant of Light or Anna Dressed in Blood-style romance; murderous, terrifying Okiku isn’t exactly the kind of guardian angel anyone would choose to have at one’s side for eternity. And you know what? I love that about this book. The fact that Okiku is a really scary ghost and remains as such throughout the novel is freaking fantastic. I don’t want to read about the power of redemptive love for a centuries-old ghost and a teenage boy; I want to see characters grow and change, but still be true to their underlying nature. In Okiku’s case, that underlying nature is a slighted, tortured, and murdered young woman who gleefully exacts revenge on other murderers. Along the same line of thought, while simple dichotomies appear to prevail in The Girl from the Well (i.e. good ghost wears white, bad ghost wears black), I love that Okiku isn’t actually *good* (I mean, the first time we meet her, she’s tearing a man apart). And I don’t want to spoil anything but holy crap, I LOVE that ending so much. Similarly, I love the fact that Tark’s cousin Callie never actually trusts Okiku (she shouldn’t), and that there is always this fear and tension between the worldly and the otherworldly. This is a ghost story, after all, and sometimes the ghosts win. 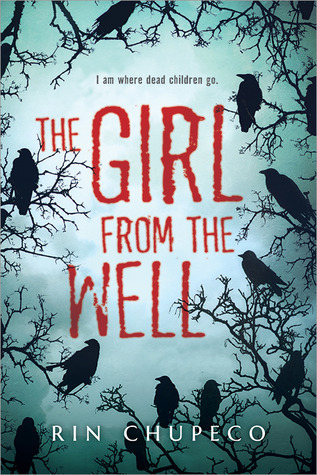 Which brings me to the next point of praise for The Girl from the Well – the two other main characters. While the book appears to be framed as solely Okiku’s story, the novel actually follows a trio of protagonists, though Okiku is the main narrative thread connecting the other two. Sixteen-year-old Tark Halloway is the victim and locus of action in this book – from childhood, he has been sacrificed for the greater good. His mother tattooed the markings on his body to bind the malevolent spirit to Tark; since then, mother has tried to kill her son many times and has subsequently been institutionalized. Tark’s character is sarcastic and aloof, but deeply, sadly lonely and yearns for his mother’s love despite everything. (On that note, I love learning about his mother’s backstory and her motivations – I won’t spoil anything, but it’s good.) In addition to Tark, there’s his eighteen-year-old cousin, Callie, who is, in a word, awesome. Callie is the true heroine of this piece, with her determination to protect and help her cousin adjust first to school and friends, but then to help him survive the demon that threatens his existence. I’ll say it again: I love that The Girl in the Well focuses on the familial bond between cousins, rather than taking a romantic angle. This. Can we please have much more of this in YA SFF? Pretty please? heave myself up and over the bathtub, to land in a heap of flesh before him. I am writhing. My body stiffens and contracts, tangled hair obscuring enough features that you would not know what I am, only what I am not. That hanging “I” is intentional; Chupeco also employs a style of ergodic writing, particularly where Okiku (and her prey) are involved. I’m not entirely convinced that it works ALL of the time, but there are moments where it undoubtedly pays off. In particular, the scene where you first discover Okiku’s feelings for the number nine. She doesn’t do nines. In addition to all of this, a huge part of The Girl from the Well‘s success rests on its skillful use of folklore (the story of Okiku and the Nine Plates) and its integration of popular J-Horror tropes. The Girl from the Well conjures immediate images of The Ring/Ringu, The Grudge/Ju-on, as well as Shutter (based on the Thai movie of the same name), The Uninvited (based on the haunting Korean film A Tale of Two Sisters), and even a little bit of The Exorcist by book’s end. Did I mention I love horror movies? IN OTHER WORDS: The Girl from the Well = THEA CANDY. Admittedly, there’s a LOT going on in this book in terms of backstory and development, but Chupeco manages to keep all these threads under control without veering too sharply into ridiculous territory. And I haven’t said anything yet about my appreciation for the diversity in the novel! Okiku is a well-known ghost rooted in Japanese folklore, and Tark is a bi-racial protagonist who straddles two worlds convincingly. While the translation and use of certain Japanese words were generally fine, there were some instances where words, particularly improper nouns, were being used incorrectly. That said, the book didn’t feel culturally appropriative, thankfully, and Rin Chupeco does a fine job of integrating folklore and culture with J-horror elements. In short: I loved this book. It hit all the right horror notes with me, and I absolutely recommend it to fans looking for a good scare. With other kinds of dead, it is different. Often their souls drift quietly away, like a leaf caught in the throes of a hidden whirlpool, slipping down without sound, away from sight. They roll and ebb gently with the tides until they sink beneath the waves and I no longer see where they go – like sputtering candlelight, like little embers that burn briefly and brightly for several drawn moments before their light goes out. But they are not my territory. They are not my hunt. And then there are the murdered dead. And they are peculiar, stranger things. You may think me biased, being murdered myself. But my state of being has nothing to do with curiosity toward my own species, if we can be called such. We do not go gentle, as your poet encourages, into that good night. Rating: 8 – Excellent; I can’t wait to read more of Rin Chupeco’s work. I finished this book a few days ago and liked it quite a bit, but I couldn’t put my finger on quite WHY (besides the fact it was so well done in terms of playing off the folklore and being J-Horror in print, which we rarely see, especially in YA). But this review captures everything perfectly — and it gave me more insight into the whys of why the book worked for me. Hooray, Kelly! I’m so glad you liked this book, too. And I’m happy I could help figure out what worked 🙂 I really, really like this book. The more I think about it, the more I like it – and that’s a rare thing! Yays! I am in the happy throes of a I-didn’t-know-there-was-a-word-for-that epiphany. You certainly got my attention. I’ve been looking at this book since I saw the cover and read the Goodreads synopsis. Going to order. Great review.